The photo above was taken by Roger Serrato, a colleague in the Desert Foothills Astronomy Club. Roger’s an expert photographer who works with both film and digital media. 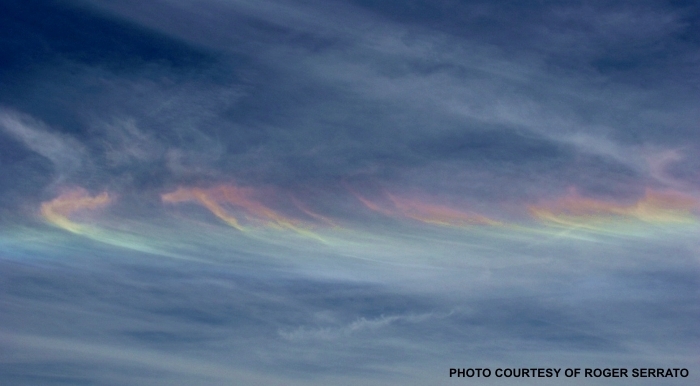 His image shows an elusive but beautiful phenomenon known as iridescent clouds. The effect itself is called irisation, from the Greek Iris, goddess of the rainbow. I say “elusive” because this is usually a very faint effect, and the ambient light and camera settings have to be just right to capture it accurately. It’s not nearly as intense as a rainbow, but can show the same spectrum of colors. However, there are some significant differences between iridescent clouds and rainbows. Rainbows are always found opposite the Sun in the sky, but iridescent clouds are always seen near the Sun. That means they’re in a brighter part of the sky, so unless you have something to block the Sun (cloud, building, mountain) the subtle pastel colors will be washed out. For Roger’s photo, the Sun was setting behind a mountain. Conditions were ideal. Further, rainbows are caused by refraction and reflection of sunlight. Iridescent clouds are caused by diffraction and interference, from small ice crystals or liquid water drops suspended in clouds. If you want a more detailed explanation, look here. If you don’t care to engage the science, skip to the last paragraph. There are several things that can cause a ray of light to change directions. Reflection is the most common, and it’s what happens when light strikes a mirror or other shiny surface. Refraction is a “bending” of light rays when they pass from one transparent medium to another, as when light enters a diamond or raindrop. Diffraction is more of a “scattering” effect, which happens when light rays strike an object comparable in size to the wavelength of light (about 0.00002 inches, or a thousandth the thickness of a dime). In the case of diffraction, the scattered light waves can interfere with each other to produce colors. This is a process where light waves overlap, and either reinforce or cancel their intensity. Different colors have different wavelengths, so you get these beautiful color patterns. That same process produces the colors you see in an oil slick floating on water. As with Sun Dogs, if you take the time to look for them, and stand where the bright Sun is blocked by something, you can often see iridescent clouds you otherwise would have missed.